Chicago, IL–(ENEWSPF)– Center on Halsted is proud to launch two semester-long culinary training and job readiness programs, one for youth and one for adults, this fall. After successfully passing a competitive interview process, participants in these two programs will learn culinary arts, job skills, and receive assistance with seeking employment after graduation. The What’s Cookin’ program at Center on Halsted provides youth with a unique opportunity to develop their culinary abilities in a fast-paced and professional setting. Under the direction of Chef Sophia Sarabia and Assistant Chef Kimberly Nies, the program truly lives the mantra of “you are what you eat.” The instruction educates participants on the importance of nutrition and physical well-being. Students become familiar with the appearance, flavors and appropriate cooking methods for a range of vegetables, fruits, herbs, and grains, with an emphasis on using fresh and local food. This fall, 15 youth will participate in the program, selected from a pool of more than 100 applicants. The program runs 10 weeks and meets for three hours on Sunday, Monday and Wednesday from October 10 to December 15. Each student is paid a stipend for his/her participation, in an effort to make this experience as much like a real world job as possible. What’s Cookin’ provides these at-risk youth with marketable job skills and increased nutritional knowledge, and aims to inspire an entrepreneurial spirit. Perhaps most importantly, the program is a source of stability for many youth who need it. The Silver Fork Program at Center on Halsted will prepare adults for careers in the food service industry. Through a comprehensive training program, 11 participants will gain skills for the food service industry. Silver Fork aims to lend a hand to Chicagoland-area adults who face the steepest obstacles in securing employment, whether because they are homeless, were once incarcerated, or lack education and/or a social support system. The Silver Fork program will run 12 hours per week (Monday, Tuesday and Wednesdays) from November 8, 2010 through March 2, 2011. Participants will be paid $350 if they complete at least 80% of the program and graduate. 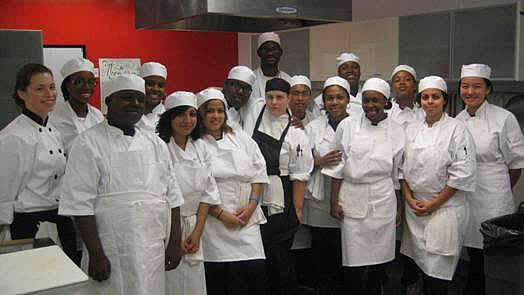 The program is a blended training of culinary skills, restaurant knowledge and job readiness. Participants will receive free BASSET and Sanitation certification, especially valuable since most food service jobs require both certifications. Upon graduation, participants will have employment assistance provided by a Center on Halsted Employment Specialist. The first stage of training (105 hours) will focus on food service, including kitchen basics, alcohol training, sanitation, front-of-house, customer service, team building, and serving. The second stage (30 hours) will teach job readiness skills including career research, resume preparation, interviewing, and relationship building. Professional chefs, trainers, and Center on Halsted career specialists will conduct the training. Center on Halsted is the most comprehensive lesbian, gay, bisexual, transgender (LGBT) community center in the Midwest, and we strive to meet the social, recreational and cultural needs of people of all ages in a safe and nurturing environment. Every day, more than 1,500 people walk through the doors of our 60,000-square foot building, which includes a gym, theater, computer lab, two art galleries and a rooftop garden. We offer a variety of social services and public programs, including mental health services, support groups, and free HIV testing 7 days a week. www.centeronhalsted.org, 773.472.6469, open 8am – 10pm daily.